Phew… after a fun 7-episode roll-the-dice-have-fun first season, we’ve just posted our eighth episode, first one of this “season 2” – with Vancouver band You Say Party! We Say Die! – HOT!. GO CHECK IT ALL OUT AT TCR DOT COM! And if you have not subscribed to TCR, you really should… we’ve got 5 episodes in the bag and will be posting new shows every 2-3 weeks from now throughout the summer, covering festivals like the Telus World Ski and Snowboard Festival, New Music West and Wakefest… and we’re always looking for support and sponsorship too! Perhaps this is the universe trying to tell me that only a dude in Greece with a “Niki!” message was meant to run this distance. Plantar Fasciitis – just the name itself is enough to make one wince. As I sit here typing, I am rolling and massaging my feet over 2 frozen cans of OJ – a neat trick of cool compression therapy advice from my sister. And with this impossible condition, one is supposed to just “stay off your feet” – huh? How is this possible? So I’ve hired some unemployeed lackeys as my support team to bring me beverages, food and hockey games on the tele. Not a bad time of the year to be off my feet, really. Last year I ran the Vancouver Marathon 4 weeks after a rather disturbing concussion. I made out okay, just under 4 hours. This year I was hoping to have a go at 42 km with nothing in my way of making a great time. I even had hopes of Boston in my sight. Ack! It’s disappointing not to reach those big goals. I don’t think I’ll be drinking the orange juice in these cans under my swollen, sore feet. I hate feet. 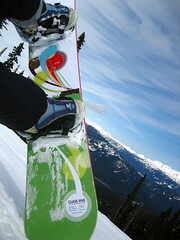 Let me just say that this snowboard rocked my world in Whistler. ThisCityRocks was pretty stoked when Class 5ive Snowboards jumped on board to be an official sponsor for an episode this season. We were fortunate enough to interview K’Naan at the Telus World Ski and Snowboard Festival that just wrapped in Whistler, and Class 5ive Snowboards sponsored the show. Class 5ive is a relatively new company in Saskatchewan, started, owned and operated by James Friedrich (yes, people from Saskatchewan go to the mountains and go down a hill or 2!). James is an engineer by trade, designing snowboards by night, and makes each snowboard by hand. Being an engineer lends itself pretty well to the science behind the creation of his boards. And local SK designers have their hands in creating the graphic look and feel of the boards – each one is different. And if they are all as good as the one I have, you can’t go wrong. They will be available to purchase for next ski season 2007-8 and can be found online here. Or just check your emails…. stop by the Yahoo! purple tent that can’t be missed near the main stage at the base in the village, hop on any number of computers and blog your days and events of this year’s festival. BUT! Here’s the best part: If you upload your videos here via Yahoo! Canada’s Video Channel, you enter to win a Sony Walkman video mp3 player, courtesy of Sony and the TWSSF! 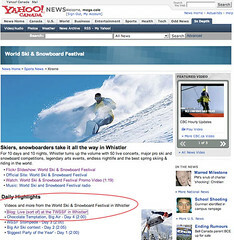 Check out Yahoo!’s video channels for the Xtreme Video uploads and the Daily Highlights. The Yahoo! 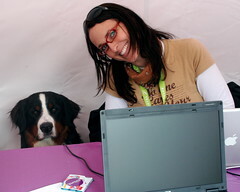 gang here are super friendly, my is dog even hanging out as the Yahoo! mascot for the day and it’s the perfect place to chill out and listen to the live music as well. Oh, and there’s free gum too! I am happily and comfortably seated (with Capo at my feet, of course) in the infamous Yahoo! Canada purple tent at the base of the gondola in the main village in Whistler… my legs are tired, my feet ache slightly and I have a fraction of a tan from the blue bird skies of the last few brilliant days on the hills. 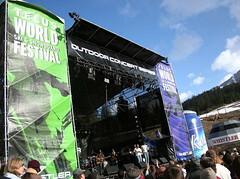 Today is Day 9 of the Telus World Ski and Snowboard Festival where thousands have descended upon this dreamy mountain resort to take in the show: live music, big air competitions, contests like guys sitting in cars for the duration of the festival (to win big), fashion, art, and hey, there’s still plenty of skiing and boarding to be had this season! 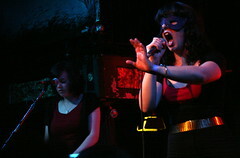 Check out what’s been filmed and uploaded on Yahoo! Canada’s Video Channel. 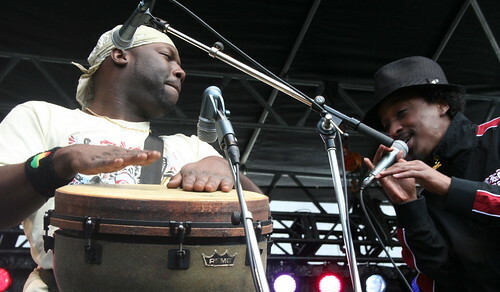 On the lineup for the next 2 days are some big bands FREE on the main Telus stage in the village: Roz Bell (grrreat T-dot band of goodness), Robertson, The Beautiful Girls, BC’s own Hayley Sales and Slackstring. Saturday night is the grand Yahoo! Big Air Party at the GLC, over-looking for greatest draw to the festival – the show is spectacular. And the weather! Could not be more perfect, which makes it all that much sweeter! Photo: Clive Hobson of Yahoo! 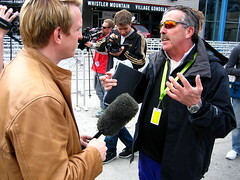 Canada interviewed by Brent Stafford of Shaky Egg Communications Inc.
Live (sort of) at The Telus World Ski and Snowboard Festival in Whistler! Hello Canada… and hockey fans from the United States… and Newfoundland…. ThisCityRocks is up in Whistler this week at the Telus World Ski and Snowboard Festival 2007, minglin’ with the crowds, snappin’ some pics and shooting some HOT bands! If you live near by, you should head up here! And yes, it’s still snowing! And just who has TCR interviewed in this (still snowing) winter wonderland, you ask? Well for one, Somali-Canadian hip-hop global success: K’Naan. His concert this past week-end was nothing short of inspiring and his music contagious, and he was simply lovely to sit down with and talk to. (Interview to be posted next month). Yahoo! Canada is also live on location as one of the Festival’s new sponsors this year. You can’t miss the big purple tent at the bottom of the Gondola. They have set up a live blogspot and anyone can pop by and upload their pictures and videos from the action of the week. Check out what’s been uploaded from the first few days of the festival. I will most certainly be trying to bring you more action from the festival via the blog and my flickr, so you can feeeeeel the music and smell the snow via the internets, alas, there’s a fresh cover of white butter and a stellar new snowboard calling my name! !